I don’t know who this prayer is meant for, that will lead to the deliverance of others, please if it is you, key into the atmosphere of prayer, release yourself, let go of your worries, let go of your emotions and let God have His way. Please join me in this prayer, all you have to do is believe and you will be established. 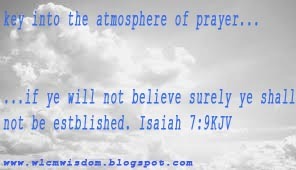 (Isaiah 7:9) if ye will not believe, surely ye shall not be established. In Jesus’ name, Lord Jesus with a grateful heart, we thank you today, the Rock of Ages, the alpha and Omega for the gift of life, your protection, love kindness, faithfulness in our lives. Our hearts rejoice in the LORD: our mouth is enlarged over our enemies because we rejoice in your salvation. There is none holy as the Lord, for there is none beside thee, nether is there any rock like our God, you that raise up the poor out of dust, and lifted up the beggar from the dunghill, to set them among princes, and to make them inherit the throne of glory: for the pillars of the earth are the Lords and he hath set a wall upon them. We worship you that keep the feet of his saint; and the wicked shall be silent in darkness for by strength shall no man prevail. You disappoint the crafty of the wicked so that their hands cannot perform their enterprise. Blessed be the Lord, who hath not given us as a prey to the teeth of the evil doers. Our soul is escaped as a bird out of the snare the fowler, the snare is broken and we are escaped for the rod of the wicked shall not rest upon the lot of the righteous, lest the righteous put forth their hands unto iniquity. We thank you for your powerful hand in our countries, states, local government areas and villages. 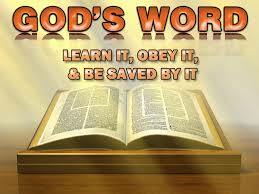 According to thy word in Isaiah 43:25 please for thy name sake blot out transgressions. Jesus, into your hands I commit all the treasured readers and leaders of this Blog. Whatever they may be passing through that deprive them of your Peace in their lives, their goals and dreams; I place them into your ever wonderful able hands. Untimely death is not their portion. They shall not die but live to declare the work of the Lord in the Land of the living. For even the captive of the mighty shall be taken away and the prey of the terrible will be delivered, God will contend with those that contend with you, those that oppressed you he will feed them with their own blood that all flesh may see and know that He is your redeemer the Holy one of Israel. I declare joy and peace into your life, all your endevours. Disappointments are not your portion. Affliction shall not arise the second time. With the blood of Jesus, I cancel every evil repetition of circle in your life. For your shame ye shall have double. You are the apple of God’s eyes, whosoever cursed you, as he love cursing, so let it come unto him; as he delighted not in blessing, so let it be far from him. As he clothed himself with cursing like as with his garment so let it come unto his bowels like water, and like oil into his bones let it be unto him like a garment which covereth him, and for a girdle wherewith he is girded with continually. Let this be the reward of our adversaries from the LORD, and of them that speak evil against our soul. Help us o God, save us according to thy mercy that they may know that is thy hand; that thou, LORD, has done it. Let them Curse, but bless thou: when they arise, let them be ashamed, but let your people rejoice. Let our adversaries be clothed with shame and let them cover themselves with their own confusion, as with a mantle. We will greatly praise you o Lord with our mouth, for you are the God that frustrate the tokens of the liars and make diviners mad, that turn wise men backward and make their knowledge foolish. That confirmed the word of his servant and performs the counsel of his messengers that say to Jerusalem, thou shalt be inhabited; and to the cities of Judah, ye shall be built, I will raise up the decay places thereof. That say to the deep be dry and I will dry up the rivers. The God that declare the end from the beginning, and from ancient times the things that are not yet done, saying my counsel shall stand and I will do all my pleasures. For God shall stand at the right hand of poor to save him from those that condemn his soul. 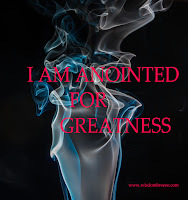 You are sealed for greatness! For I pray and ask with thanksgiving in Jesus’ name. Amen. "I am saying thank you to all the treasured readers and leaders of this blog. thanks a lot for your effort, contributions and comments. I really really appreciate God bless you all!!!" When the LORD turned again the captivity of zion, we were like them that dreamed. Then was our mouth filled with laughter, and our tongue with singing: then said they among the heathen, The LORD hath done great things among them. Chinco bee, in Jesus name I declare Greatness upon your Life. kingdoms and nations will rejoice with you. you are sealed for Greatness. you are a public figure with God's Divine Grace. This prayer is just for me and I say amen to every declaration and prophecies..
As you prayed so shall it be in Jesus name. Amen. Miriam Ezeka, Rejoice for the set time to favour Zion is now. Am doing Great Didi!! thanks for asking. Sweetie hope you are coping fine?? Thanks for asking Pst. Gloria. All is well. I key into this prayers.